"a boat. a bridge. a lamp." For thirty-five years Jane Lillian Vance’s highly narrative and studiously detailed paintings have been concerned with bridging the space between East and West. The Dalai Lama's favorite poet, Shantideva, wrote in the 8th century classic Heart Sutra: "May I be a boat, a bridge, a lamp for those desiring the further shore." In many ways, Vance's work offers passage--into luxurious naturalist detail, as well as into severe and magnificent contemporary landscapes and collages. Born in 1958 in Greensboro, North Carolina, Vance attended the College of William and Mary, Exeter University in Devon, England, and Virginia Tech. For a dozen years, she taught The Creative Process at Virginia Tech through the Department of Religion and Culture. Vance is internationally known for creating oil paintings with brilliant detail and vivid, painstaking iconography, from Tibetan Buddhism and the folk arts of the Himalayas, as well as from rural Zambia, in her current thirty Africa Series paintings about medicine and hope. Her paintings are housed in private collections on four continents. 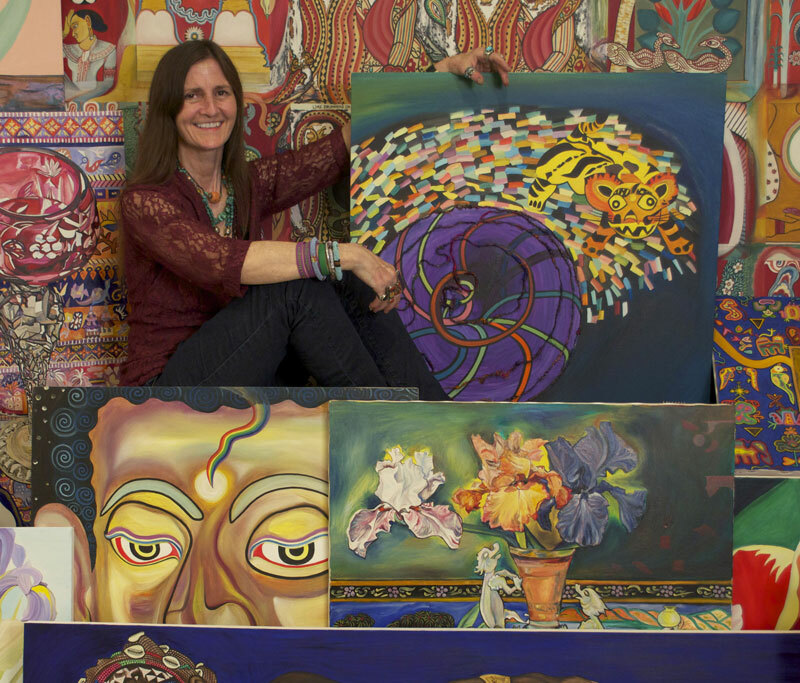 For many years, before public notice, Vance worked constantly on her elaborate, increasingly Tibetan-focused oil paintings, until acclaimed art critic Suzi Gablik visited Vance and began their friendship, writing about Vance in Satish Kumar’s Resurgence magazine, and in "Images of Earth and Spirit," an English anthology of spiritual contemporary art. In the winter of 2000, accompanied by her friend Amchi Tsampa Ngawang Lama and videographer Jenna Swann, Vance crossed an 18,000-foot Himalayan pass in a snowstorm during a month-long trek in Nepal’s Annapurna region. It was during this trek with Amchi Tsampa that he and Vance planned the Buddhist lama’s first visit to America, where he would later live for six months at Vance’s home, studying and teaching together in Blacksburg, Virginia. During these months the Buddhist lama initiated Vance to begin his lineage portrait. With film producer Tom Landon joining videographer Jenna Swann, the journey of the Amchi painting would become the Motion Picture Academy of Arts and Sciences award-winning documentary, A Gift for the Village. Vance's voice can be heard in her TEDx talk and in her contribution to National Public Radio's StoryCorps. In February, 2017 she and Gil Harrington co-authored Morgan Harrington: Murdered and Dead for Good, A Mother's Quest to Find a Serial Killer and Healing, about the murder of her student, the eventual capture of serial killer Jesse Matthew, and the work to build a world-wide positive legacy for Morgan. Vance serves as Vice President of the national non-profit foundation formed to alert young women to sexual predatory danger, Help Save the Next Girl. Vance lives with her cats and glorious sprawling gardens on three acres along a roller coaster rural road in the Blue Ridge Mountains of Virginia.